Omega Learning® Center is committed to providing the most comprehensive and accurate assessment process in the industry. 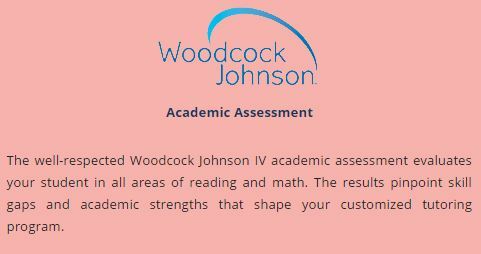 Each student receives the well-respected Woodcock Johnson IV academic assessment, which is used by most schools and educational professionals. 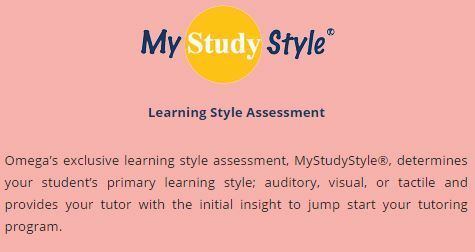 Students also receive MyStudyStyle®, Omega’s proprietary learning style assessment and programs are customized for each student based on the assessment results, school grades, study habits, and your academic goals. The Woodcock Johnson IV assessment, administered by all Omega Learning® Centers, provides an exact grade equivalency for key academic areas within reading and math. Reading academic areas of testing include sight words, reading fluency, passage comprehension, phonics, and vocabulary. Math academic areas of testing include calculation, math facts fluency, word problems, and number matrices (math reasoning). These key areas of testing are directly aligned with the academic concepts needed to succeed in school. Omega Learning® Center creates a customized tutoring program based on the results of this valuable assessment. Omega’s certified math and reading tutors are to able review assessment results and focus on the academic areas in need of strengthening, maximizing your time and monetary investment in a tutoring program. Tactile – You learn best through TOUCH. You learn best by using hands-on manipulatives and experiencing the learning through action.